Hey everyone! Just wanted to fill you in on a special project I've been working on. The beauty editors at Bridal Guide magazine contacted me about doing a 4-part video series for their website during the month of May. They'll each focus on a slightly different aspect of Bridal Beauty- the first is all about getting flawless skin! 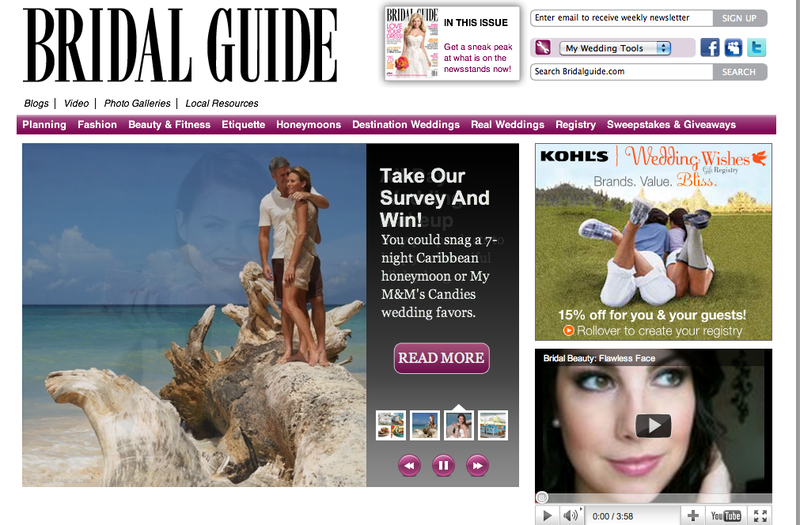 Each Monday in May- a bridal video of mine will be posted on the Bridal Guide website! It will be exclusive to their site at first, and later in the week, I'll make it public on my YouTube channel. I was excited to take part in this project, because I know how perfect we want to look on our wedding day, and I believe it really is possible to do it yourself! And just so you know- not ALL of the videos are makeup-related... there's one about hair, too! :) So keep checking back with my channel, and Bridal Guide on Mondays in May for the latest video in the series! Click here to visit the Bridal Guide website! As always...Great video Emily! Where were you when I got married last year?!?!?!? :) I have no doubt that this will be such an invaluable tool to many brides-to-be out there! My expectation of this dress was not high. However, when I received it in the mail and tried it on, it completely blew me away! It was so beautiful and figure flattering. If you are looking for free online movies, please check out showbox app. Install showbox for showbox online movies. one spot for online movies! good and direct website to root explorer apk free download . here i am showing you the official site link to get root explorer apk for free. Nice article. see this page to get showbox for free.